180 Ans de Creations 1828-2008: launched in 2008. 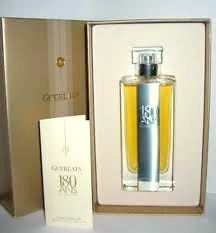 Guerlain's 180th anniversary was celebrated with a brand new limited edition perfume, composed by Jean-Paul Guerlain. A non-commercial perfume gift offered only to loyal customers and industry people. "To celebrate an exceptional event, Maison Guerlain's 180-year anniversary, Jean-Paul Guerlain has composed a very contemporary fragrance which has been created in traditional Guerlain style. With sensual amber notes that stir the senses, and a bottle which has been hand-sealed by the "dames de table", this limited edition scent, which will NOT be available for sale, has all the rarity and uniqueness of a collector's item." So what does it smell like? It is classified as an ambery fragrance for men and women. The 75ml Eau de Parfum is housed in the square Elixirs Charnels bottle decorated with an elegant strip of metal bearing the perfume's name.